The graphic would be more awesome if the the lines thickness were weighted by something like market cap or customer deposits. The graphic would be even more awesome if the tie in to monopoly could be explained. Isn't the tie in to monopoly quite obvious? Where there once were 37 companies in a particular market, there are now just four. That's 1/9 as much competition as there was just 20 years ago. How can that possibly not be relevant here? I see that. The issue I have is that the complaints here are typically related to government sponsored monopolies. 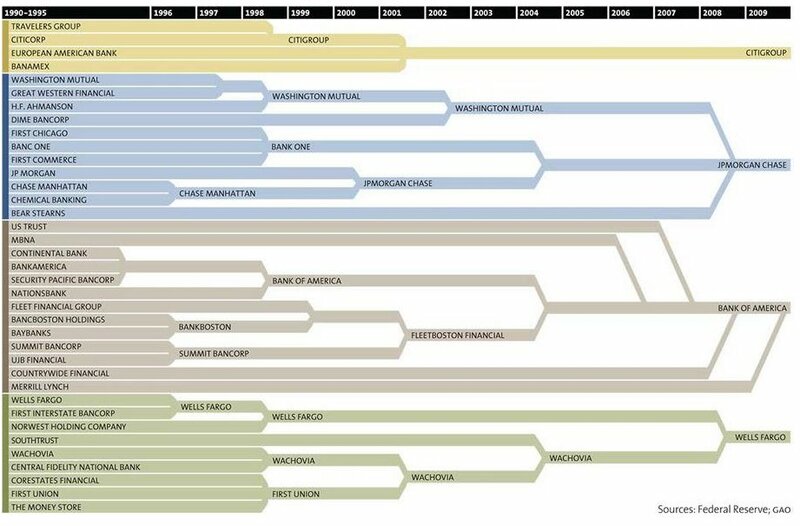 If anything, the government has prevented further consolidation of the banking industry. Had the government not stepped in, it is quite possible there would only be one line on the chart above instead of four. In some industries where margins are low or where investment costs are high, consolidation seems to be the trend regardless of whether government sponsored monopolies exist. Well, first of all, the site's name is just "Against Monopoly", not "Against Government-Sponsored Monopoly". And secondly, government regulations create significant artificial barriers to entry in the banking and finance sector. There's a whole damn regulatory *agency*, the SEC, just for them. Relaxing antitrust and similar regulations, without relaxing the ones that create the barriers to entry, results in what you see in the graph above. Back in the days of the Wild West there was little banking regulation at all and a diversity of players (but, no deposit insurance or other consumer protections to speak of, either). Banking was better before a Republican congress started monkeying, in 1998, with the regulatory structure of the industry. If you examine the chart above there were only a few mergers before that -- and a ton in 1998 itself, and a ton more since then. We also had had almost no significant market downturns since *World War II* until shortly after 1998. Recessions were weak and infrequent. Then there was a large recession in 2000 that evaporated *trillions* of dollars from the stock market, which was a pipsqueak compared to the mortgage meltdown in 2008 -- for two significant downturns in less than the next ten years. The latter has seen the largest percentage drop in GDP since the second world war ended and the highest unemployment rate since the *Great Depression*. It's also the longest since the Great Depression ... and still ongoing, to judge by the present unemployment rate which has still not dropped to pre-2008 levels. To find comparably bad recessions farther in the past, you generally need bank failures, in quantity. Before 2008 the biggest bank failure event was the Great Depression. Before that, they, and bad recessions, happened frequently during the era of totally unregulated Wild West banking, but had become rare after banking regulation began ... aside from the Great Depression. It would be interesting to see exactly what led to the mergers and also to see how that now plays with the SEC preventing further consolidations. Meaning, are there two different government intents now fighting with each other, one that encourages consolidation and one that prevents it? I was quite amused to learn that prior to the Great Depression that bank failures en masse were a relatively frequent phenomenon. The bank failures seemed to occur for a variety of reasons, often leading to a domino effect. Sadly, depositors and investors frequently got caught in the failures, leading to widespread economic distress. Government regulation may have decreased the frequency of such events, but it has not prevented them. In a bit of irony, the bill that was passed in 1999 (there was a temporary waiver in 1998) actually DECREASED government regulation. That decrease in government regulation caused banks specializing in different financial areas to merge. Another thing that has encouraged banks to merge is that some of the merged banks were not all that strong financially. The weaker fish were eaten by the stronger fish. In the olden days, the weaker fish might have failed, only to be replaced by other weak fish. The graph above is also slightly misleading. While the graph is focused on some of the largest banks in the United States, it neglects to point out that there are still more than 6,000 banks in the United States, with an average of 120 new startups each year for the last twenty years. In spite of new entrants, as the government encourages stronger banks to support weaker banks and as the government seems intent on decreasing regulation, consolidation appears inevitable. FDIC information indicates that in spite of approximately 120 new entrants per year, and in spite of a decreasing number of failures, the number of banks in business is declining by hundreds per year because of consolidation, aided by decreased government regulation. Here is a question: If the purpose of this site is to be against monopoly, and decreased government regulation causes a tendency toward consolidation, though perhaps not monopoly, and this site is also nominally against government regulation, how is the present consolidation of the banking industry slowed or stopped without government interference? By settling other planets, of course.